As a bride and bridegroom, making the choice for the wedding theme can be a complex and stressful task. It can test the very fabric of any relationship but it does not have to! 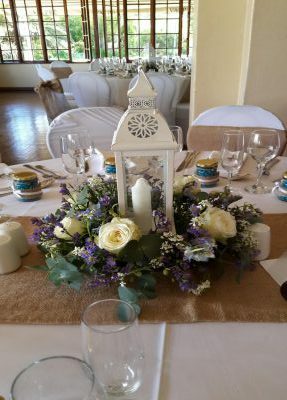 Wedding decorations don’t help the tension, however, we’re here to help, all the decorations below are our own and we’d be more than happy to recreate a unique variation for your day! Roses are the quintessential wedding flower they represent love and passion and thus are very fitting as a wedding decoration. There is an abundance of rose varieties making it far easier to find a rose to suit your taste and wedding theme. The photo above illustrates that roses are incredibly diverse in their use. They are great when submerged in water or even as a stand alone in small vases, as pictured alongside. 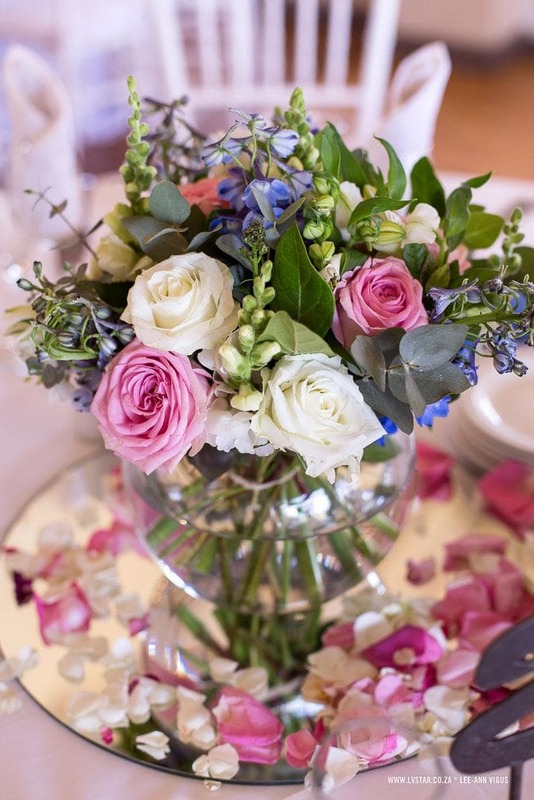 The mirror is a wonderful element when used to create a double portrayal, this makes a few stems of roses appear much fuller as a wedding decoration. This decoration is a great economical option for those with a tighter budget. 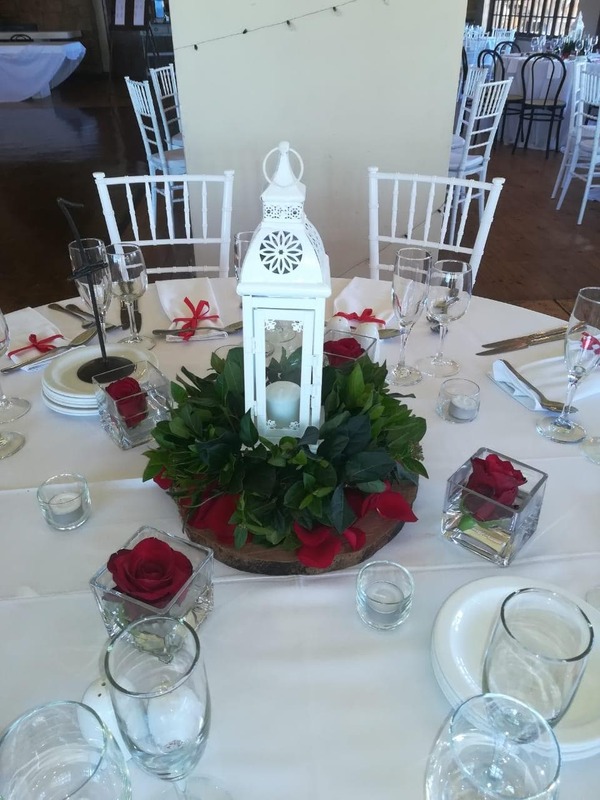 The white lantern, candle and green wreath make for beautiful wedding ideas. It will bring light and atmosphere and is a wonderful alternative to those not wanting a classic centrepiece flower bouquet. The rose buds are a great example of the diversity within roses, even though it is a similar style, the change in colour creates a very different impression to the pink roses in the previous image. 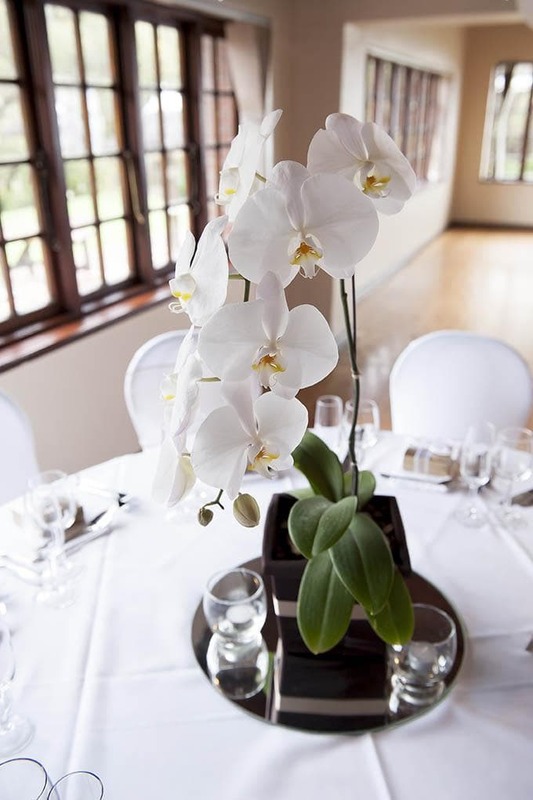 Orchid plants are always a great idea as a wedding table centrepiece. We absolutely love orchids, they also make for the perfect gift. They are available in a variety of shapes and sizes and can serve as a beautiful starting point for marriage. As orchids can live indefinitely if cared for correctly. 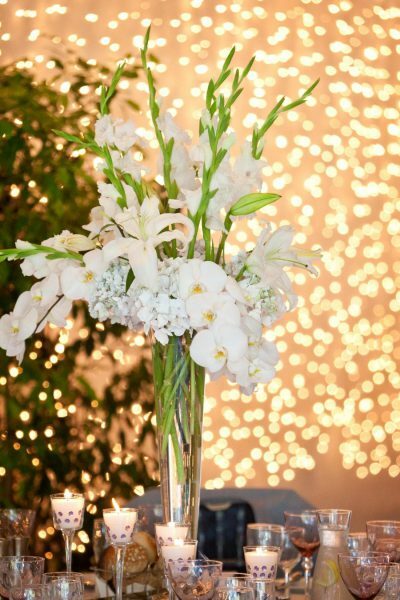 Let the phalaenopsis orchids beauty speak for itself, with little else needed to accompany the flower as a centrepiece, but if you do choose an additional decoration, votive or floating candles will do the trick! 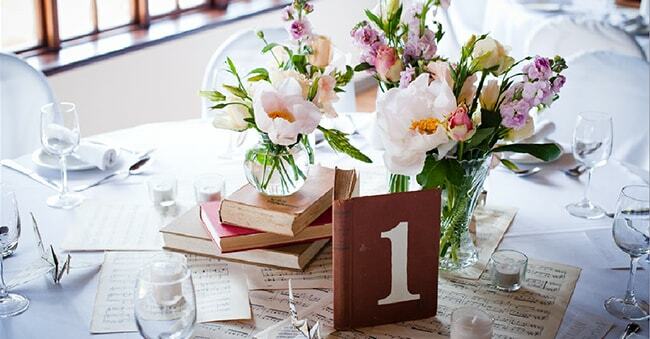 This wedding decoration idea is great for an extravagant wedding or larger tables of 12 or more. 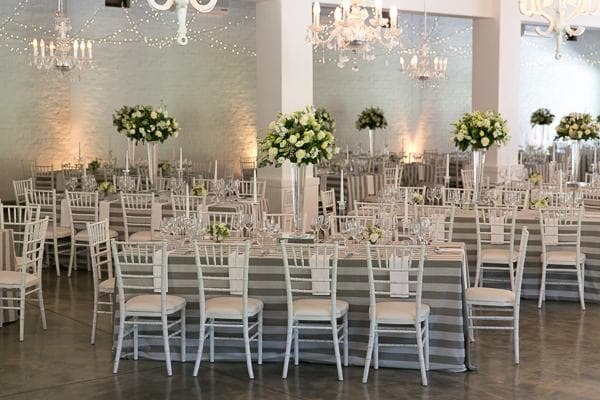 Due to the arrangements size and shape, it is better suited to a very large wedding or a space that requires a lot of volume from its decor. The pipette glass candle holders are lovely for setting the mood and create a stunning glow beneath the various flowers. 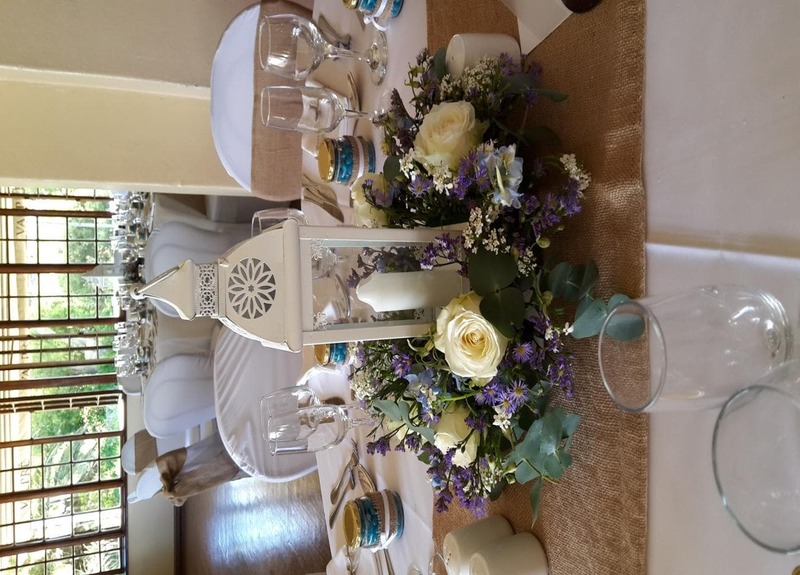 The centrepiece above is great for an informal or country style wedding. This incorporates seasonal flowers, with roses and petals on a mirror base. The mirror gives more volume to the centrepiece. The hessian runners are for those seeking a natural and laid back decoration, although this is not its only use. A barn-style wedding would see the hessian runners look flourish. The shades of lilac and yellow compliment the brown both stylistically and in colour. Make sure to use lots of natural woods or tones thereof. 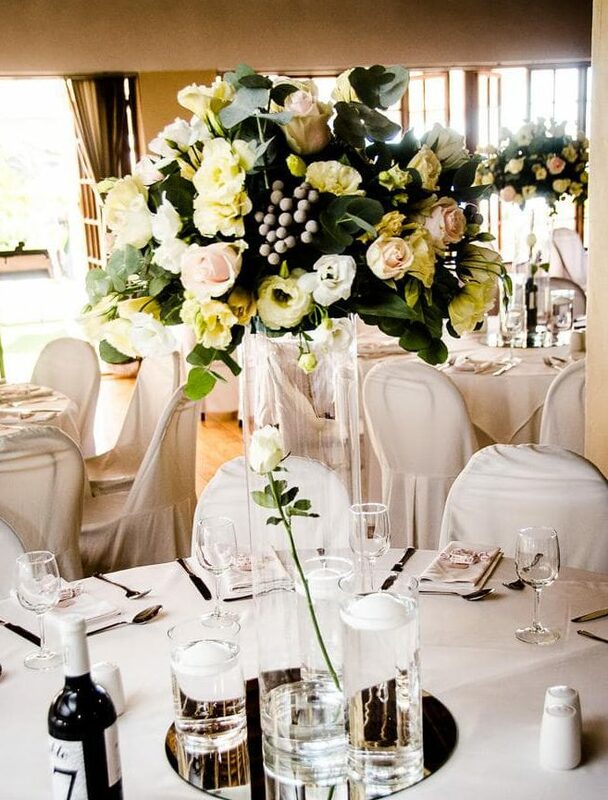 The Protea, the king of all South African fauna and flora and perhaps the king of wedding decorations. 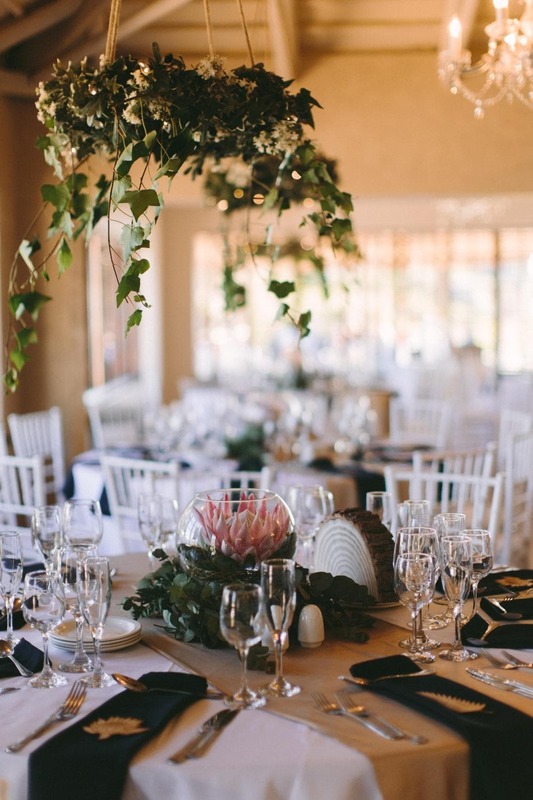 Despite the King Protea being a small arrangement, the use of an empty round vase makes this a well-suited arrangement to round wedding tables. Use an overhanging wreath to complement the King Protea set-up. Using old books or sheets of music are a fantastic way to make use of old and unwanted books, which can be great if on a budget. 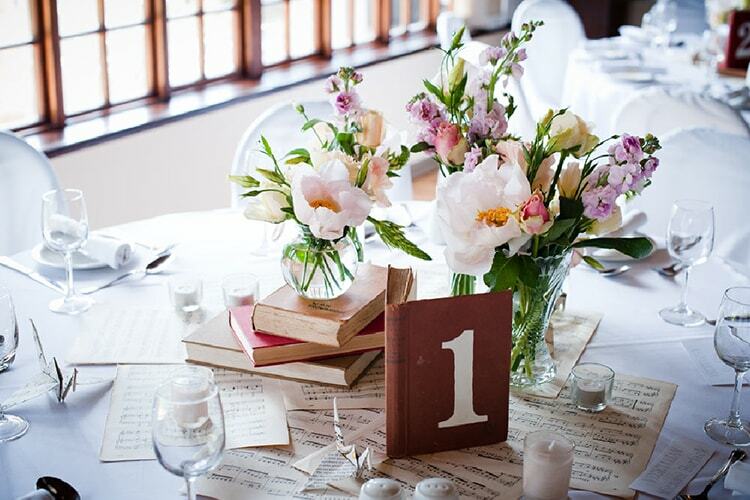 Table numbers can be painted or stuck onto the books, this wedding table decoration is well suited to any historian or muso! It is also well suited to a corporate themed event. Peonies are incredibly fragrant have a large bloom, they are the epitome of elegance and have a hefty price tag to accompany. Tealight in votive candles with antique books adds to the appearance. 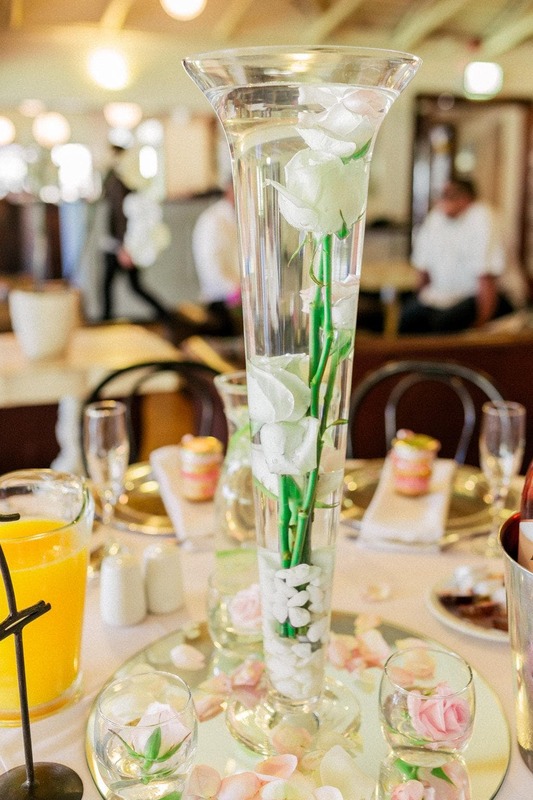 This wedding idea is the best of both worlds, a stunning large arrangement and a single rose stem. It is incredibly eye-catching and creates the contrast needed for the top arrangement to stand out! By using floating candles in cylinder vases it gives more interest to the table surface as opposed to just the top of the arrangement. The trumpet vase placed on a mirror box goes very well with rectangular tables as the height does not affect the eye-line in the same way as a round table. The two smaller arrangements make the table appear less empty. This layout is also well suited to a 21st birthday party idea as it can look beautiful without a wedding as the event. 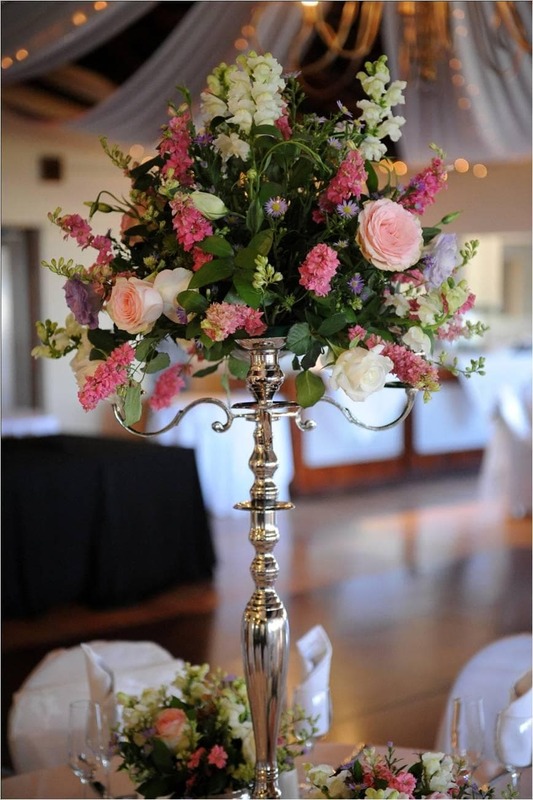 The candelabra is the more classic take on a traditional wedding, the elegance of the thin stem makes the bold arrangement both on the sides and on the top stand out more. 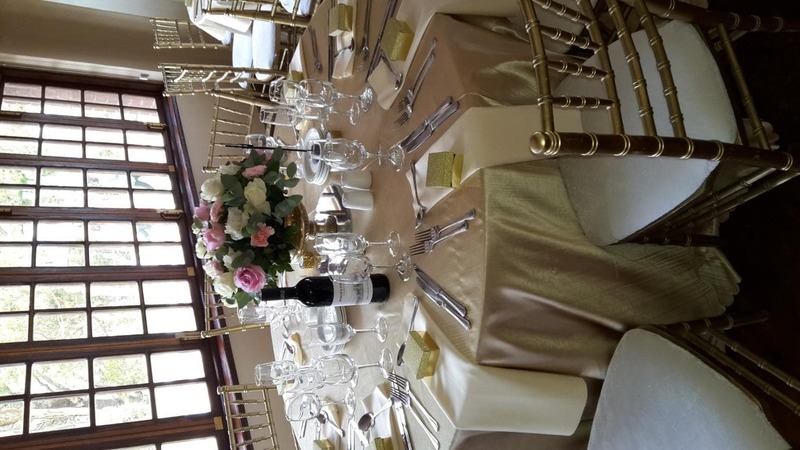 Mixed roses alongside gold can be incredibly glamorous as wedding decorations. If you’re looking for something with a little more pizzazz the gold could tickle your fancy. Try not to mix too many other colours, a couple of rose shades should do the trick. 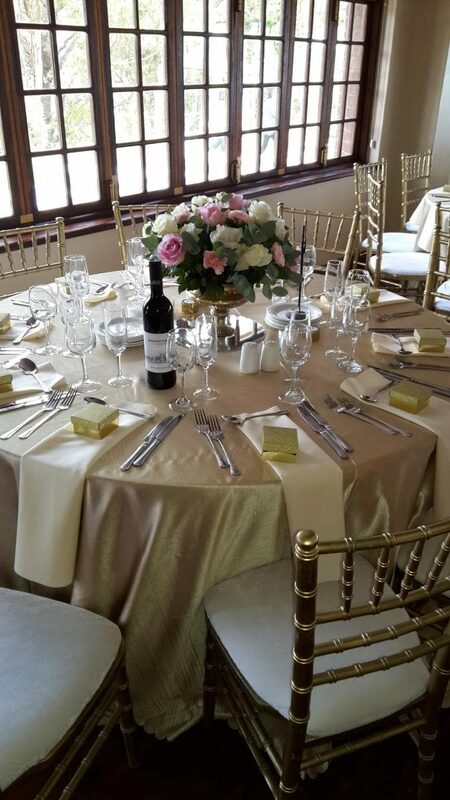 Damasque gold tablecloths complement the sophisticated look beautifully. Assorted small vases on a wooden rectangular log are very trendy nowadays, it is both natural and authentic and is good for those that don’t need perfect symmetry and prefer a bit of character. 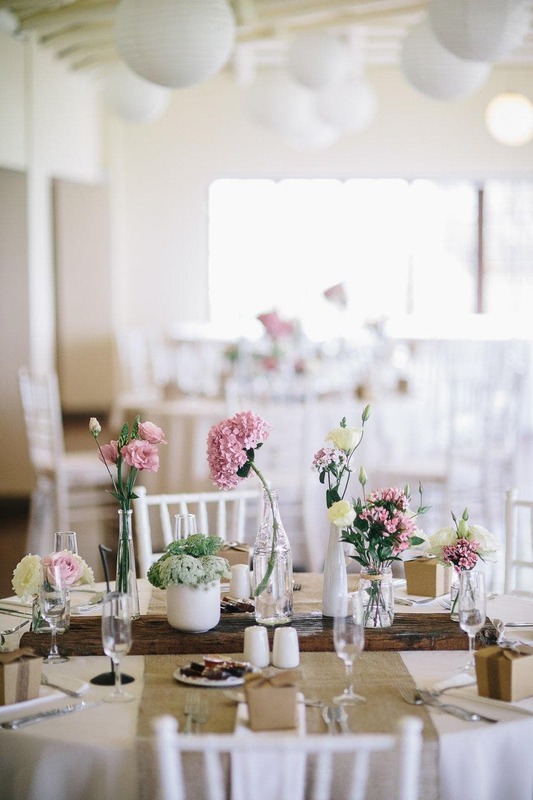 The pink and white are classic wedding colours yet the wood is not. The different styles of vases make for a more laid back and natural look.